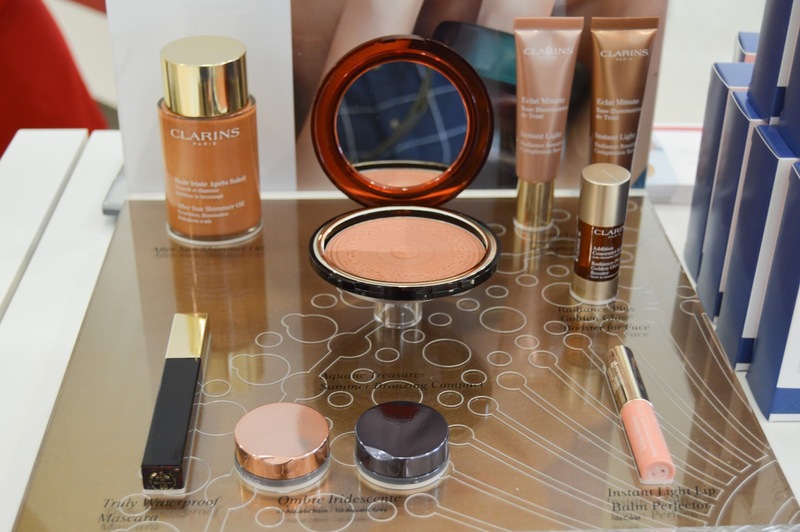 My two favourite beauty bloggers, Caroline Hirons and Vivianna Does Makeup always rave over Clarins products, but I've never actually tried anything from the brand. I've had my drugstore blinkers on and shopped the lower end priced items in the aisles of Boots, but something that Caroline Hirons always says, is invest in skincare, so I popped along to the Broughton counter, just outside of Chester, to see their latest products. Bare faced and ready, I was welcomed by the lovely ladies Amelia and Danni, both wearing immaculate make-up (jealous!). I sat on their red chair and to start my skincare consultation. 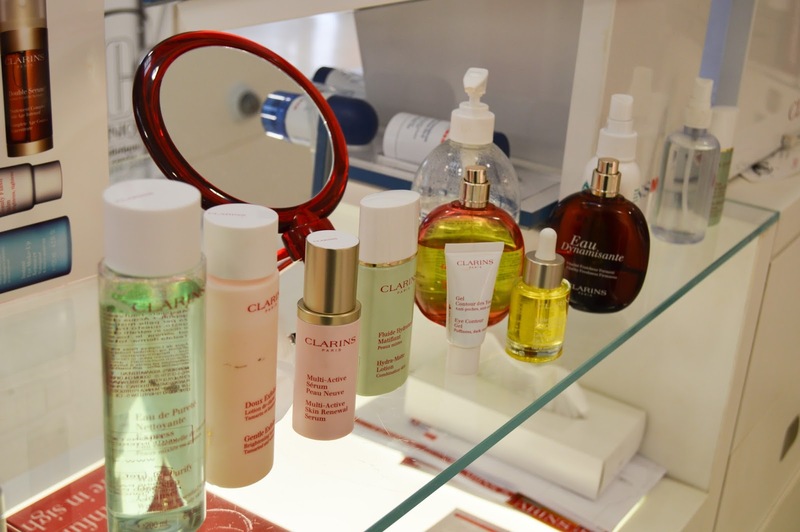 Amelia explained how they like to create a 'Clarins Bubble' with a spritz of their fragrance around the head, the scent takes you away from the shop floor to a spa like treatment zone. We began with a skincare consultation, Amelia asked a few questions about my skin. It's generally very oily and spotty but after she felt my skin she discovered it was also dehydrated. Yes oily skin can be dehydrated! The first step she used was the Purify One-Step Cleanser, just to remove any make-up on the skin, this was followed up by the Gentle Exfoliator Brightening Toner. Caroline raves about this toner so I was excited to see it in action at the counter. It's ingredients create a chemical exfoliation of the skin, which gets rid of any dead skin cells and leaves the skin looking fresh. The next two steps were the Multi-Active Skin Renewal Serum and the Ultra-Matte Rebalancing Lotion. The Serum, again refreshes the skin, it's properties are much like the Toner in that they help fade acne scarring too. Moisture was added to the skin at the right balance by the Lotion, which mattifies the skin, ready for make-up and keeps you oil free through out the day. I'd explained to Amelia that my eye area was dry and crepey, which she remedied with the Eye Contour Gel, which has a wonderful cooling sensation to de-puff your bags. I've been using it since the consultation and I adore it! I also got to preview their best selling Lotus Face Treatment Oil, it's so luxurious to the touch and smells so spa like, a perfect pick me up treatment for your skin. We then moved onto the makeover part of the consultation. Taking into consideration my oily skin, Amelia matched me with the Everlasting Foundation in 103. The famous Instant Light Perfecting Touch Concealer was added to create a flawless base. My eyes were dressed with their lovely Cream Eyeshadows, one being the limited edition rose gold shade. We went for a soft look with the eyes so a touch of their Be Long mascara was added and my brows were defined with their Perfect Brows Kit to finish the look. Another limited edition product was used, the beautifully designed Aquatic Treasures Summer Bronzing Powder was dusted across my temples and in my cheek hollows to add warmth to my face. The look was completed with a bright coral red lip, which was a combination of the lipstick shade Poppy Red and a gloss of the Instant Light Natural Lip Balm Perfector in Red. 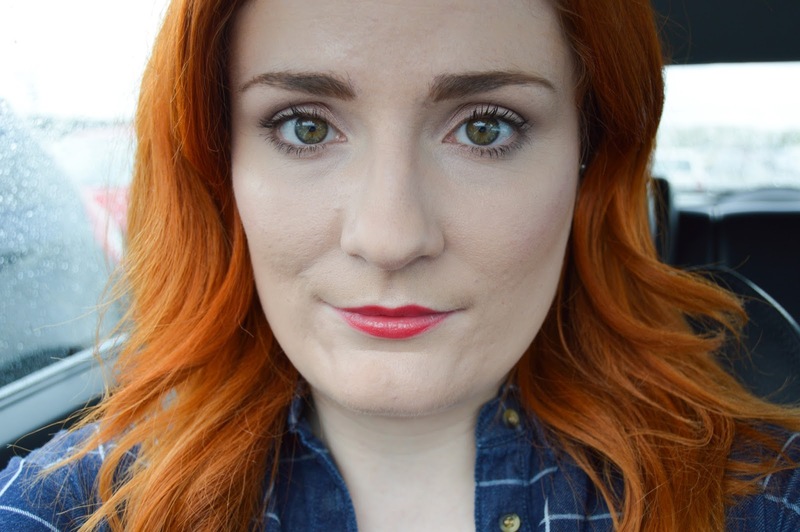 The mix of both created a vibrant shade which brightened up my complexion and made the green in my eyes pop. 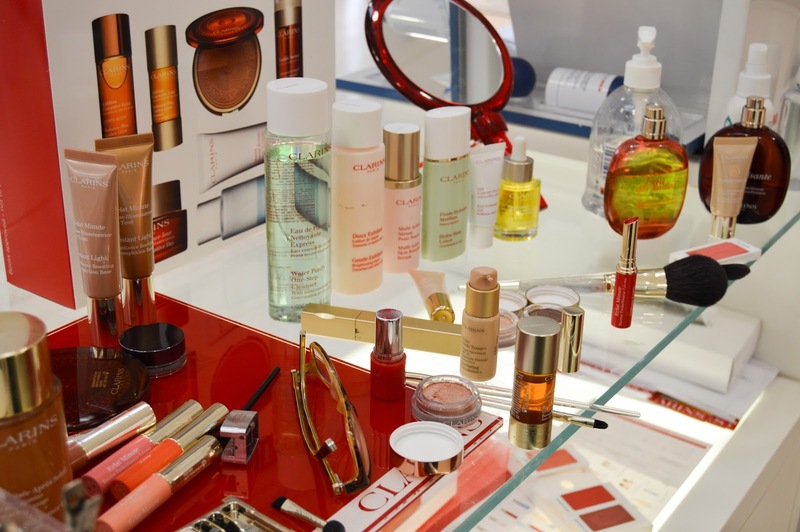 Overall, I am super happy with the service that was provided by Amelia and Danni at the Broughton Clarins counter. They made me feel really welcomed and took the time to explain the products and examine what was best for my skin. I would thoroughly recommend you visit a counter and treat yourself to a makeover and skin consultation. They gifted me some samples to try, so expect mini reviews on the blog soon. 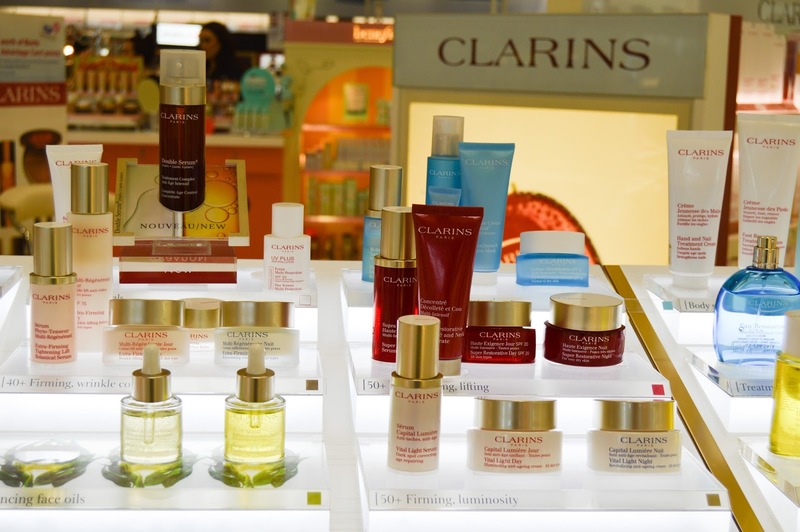 Have you tried anything from Clarins? What's your favourite product? Have you followed Cherries in the Snow on Bloglovin yet?